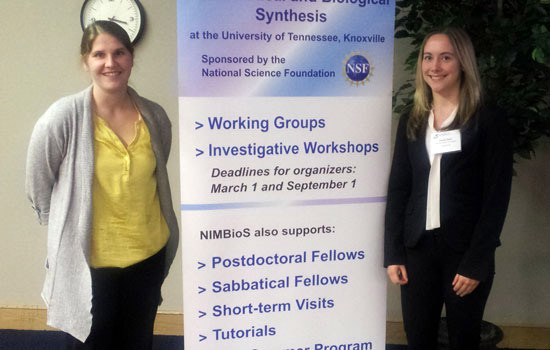 Kara Maki, left, and Molly Holz attended the fourth annual Undergraduate Research Conference at the Interface of Biology and Mathematics, in Knoxville, Tenn. Holz presented a poster on the research she performed with Maki. Being able to secure funding for research is a goal held by many faculty members throughout higher education, though it is one that often takes years of proposals and refinement to achieve. Kara Maki, in her second year as a faculty member at Rochester Institute of Technology, considered winning a major research grant early in her career to be a best-case, albeit unlikely, scenario—yet that is exactly what happened. Maki, an assistant professor, and David Ross, a professor, both in the School of Mathematical Sciences in the College of Science, are the recipients of a portion of a multi-university, $3.8 million federal research grant given out through the Advanced Manufacturing Jobs and Innovation Accelerator Challenge program. The grant, which is intended to grow advanced manufacturing and create high-tech jobs, was given out in two parts, with $1.9 million going to a Central New York team, led by Syracuse University, and $1.9 million going to a Rochester-area team, led by the University of Rochester, of which RIT is a member. The funding for Maki and Ross’s research will come equally from Bausch & Lomb and the U.S. Economic Development Agency. Maki and Ross’s research, which ultimately aims to improve the design process of contact lenses, began as an attempt to create a model of the tear film on the human eye. Maki performed this work for her doctoral thesis at the University of Delaware. She continued along a similar line of research during her post-doctoral studies at the Institute for Mathematics and its Applications, where she worked on biological fluid flows. 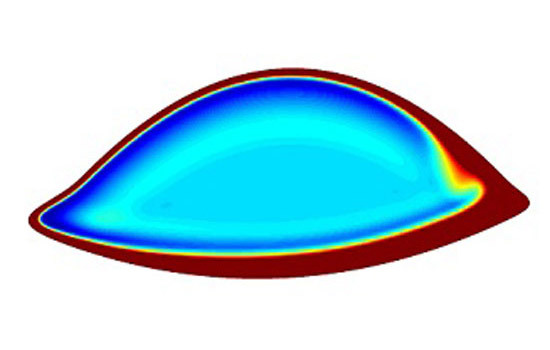 Her research has progressed into its current form, which seeks to create a new way to mathematically model the fluid mechanics that dictate how a contact lens conforms to the eye. The two RIT professors are working closely with researchers at Bausch & Lomb, one of the world’s leading producers of contact lenses, based in Rochester. One of the goals of the research is to use the mathematical model to alleviate dry eye syndrome, which can be caused by contact lens wear. Last year, Maki was one of eight faculty members who were recognized by the RIT START Awards, short for “strategic acceleration of research for tenure-track faculty.” The awards, which were given out by RIT’s Sponsored Research Services, honored the faculty members for research achievements tallied within their first two years at RIT. This provided Maki with seed funding that enabled her to perform initial research and write a proposal for the grant. Additionally, she was able to enlist the help of second-year biomedical engineering student Molly Holz as a result of the START Award. This formed a mutually beneficial relationship, with Holz receiving hands-on experience and Maki receiving assistance with her research. The support from fellow faculty members, such as Ross, as well as the opportunity to “hit the ground running” through seed funding are some of the factors that Maki says have enabled her to research what she loves. Maki and Ross are part of the Center for Applied and Computational Mathematics, which is an interdisciplinary research center at RIT that involves professors from the School of Mathematical Sciences and the School of Physics and Astronomy, in addition to the Kate Gleason College of Engineering. A 3-D model of the tear film of the eye. Second-year biomedical engineering major Molly Holz, right, helped assistant professor Kara Maki conduct research into how contact lenses interact with the tear film of the eye.